When martensite is tempered, it partially decomposes into ferrite and cementite. Tempered martensite is not as hard as just-quenched martensite, but it is much tougher. 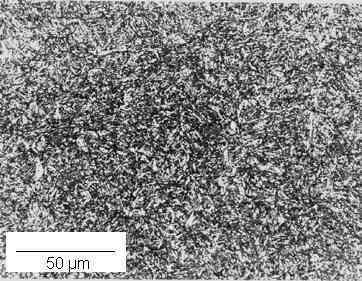 Note also that it is much finer-grained than just-quenched martensite. Tempered Martensite Photomicrograph Copyright © British Steel; Used with permission, Courtesy of Corus.